Le Tigre has been an online writer for 10 years. They're articles often focus on tattoos and tattoo artists. 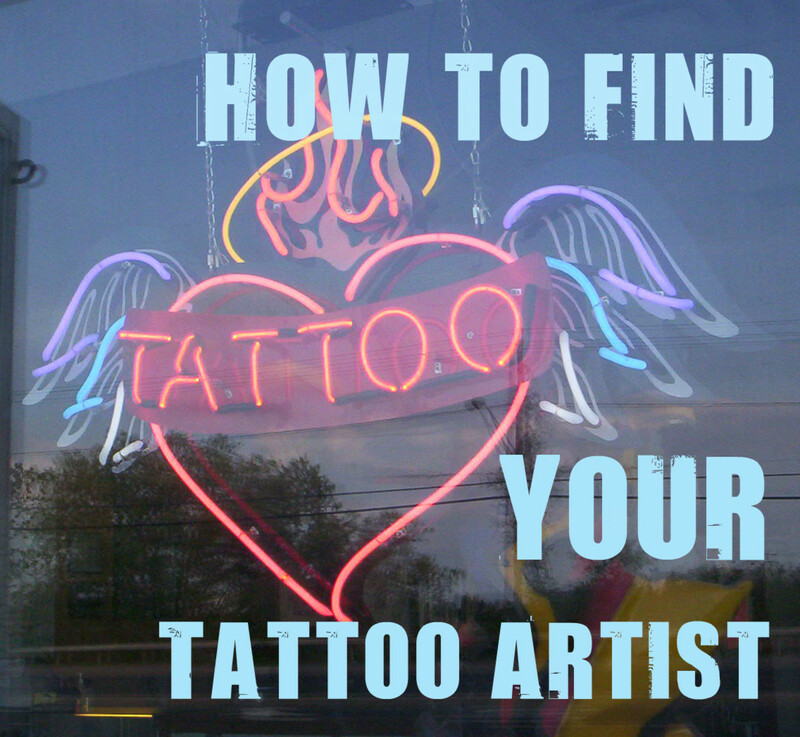 Tattooing is an art form that many people think is no different than drawing. That is not entirely true, though. 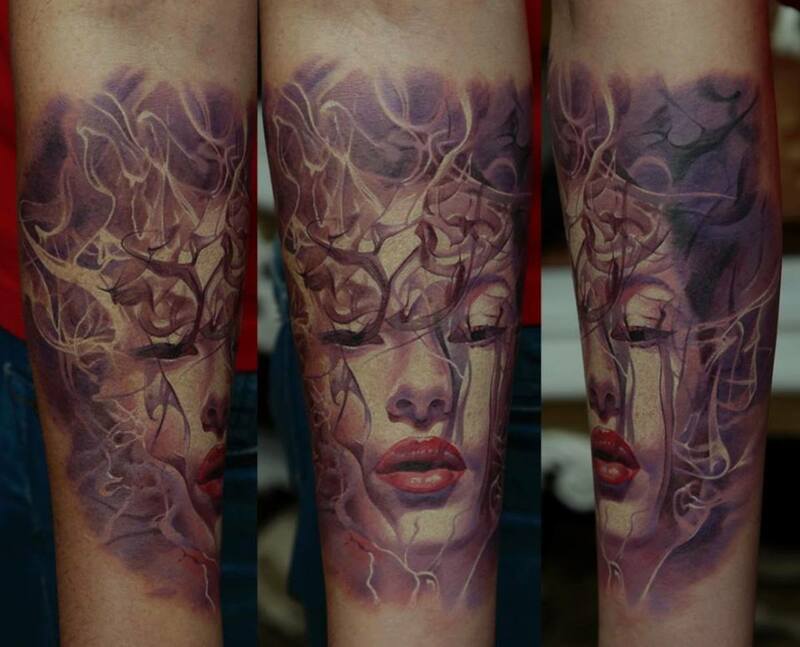 There are some important overlapping skills but being a tattoo artist is not the same as being a sketch artist. 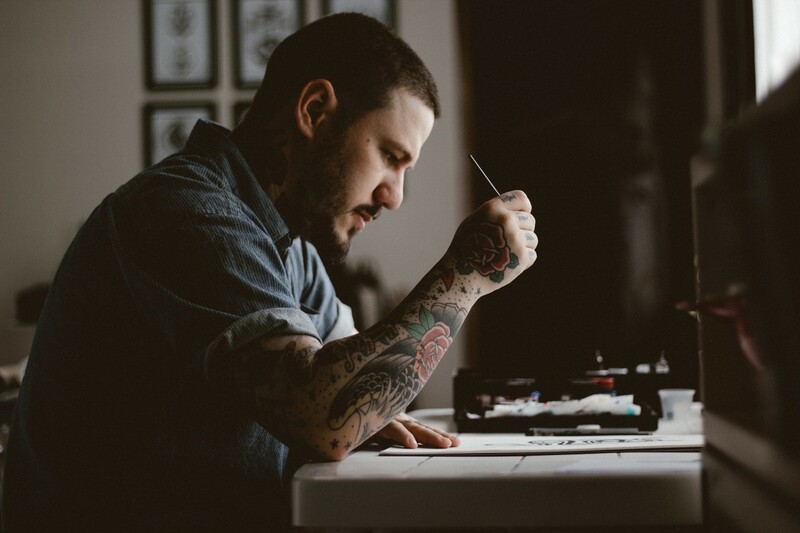 A good tattoo artist has a strong eye for shape, color, and line work. I am going to give you some exercises that will help you regardless of the type of art you want to do. Draw in pencil everyday. Draw the things that are around you as exactly as possible. Don't shade anything. Tattoos are very much defined by the line, so get used to thinking about the things you draw as being made up of a collection of lines. Keep these drawing in a safe place for later. Push yourself to draw increasingly complicated things, such as the pattern of brick on a building, wallpaper, or designs from clothing. Once you have 10 -12 finished drawings get a medium tip pen and a glass table or a window. Place a clean sheet of paper over your drawing and ink all of your lines. You are trying to make your lines as clean (not wobbly) as possible. Compare your original and the inked version. You will notice that many of the intricate details bleed together. Repeat the pencil and ink process again. Over time you will find that your choice of lines, your inking, and your ability to draw in strange positions will improve. Once you've mastered lines, you then move on to visualizing how shapes change when they are applied to a surface that isn't flat. Start by collecting coffee cups, or any drawable container. Ink your drawings directly on to the surface of the cup with your medium tip pen. Keep going until your lines are as good on a cup as they are on a flat paper. Now that you can ink a cup, get some wide masking tape and tape a body part placing each strip right next to another strip. Then, use your medium tip pen to lay your lines down. Notice how the image looks from various angles and how the body part changes the appearance of the image. 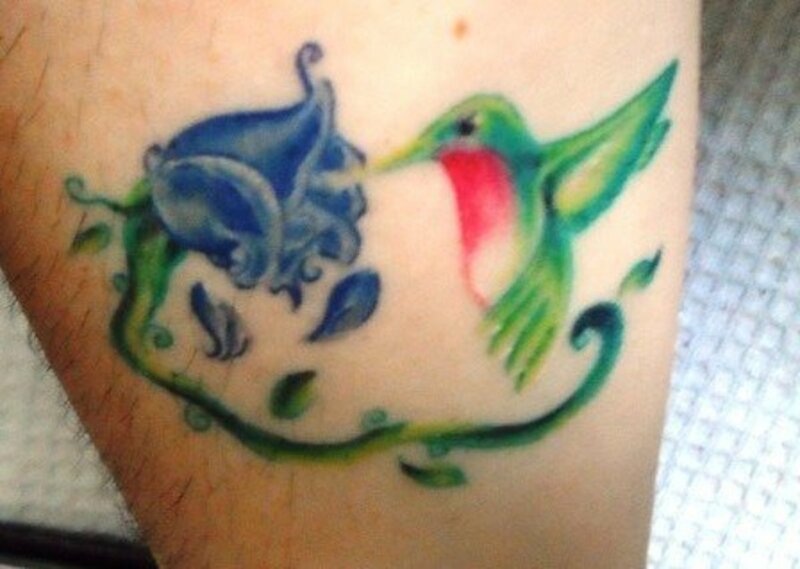 Getting a good sense of color for tattooing is going to be a major plus. Not only do you have to understand what a color will look like when it mixes with flesh tones you need to get good at picking and separating colors. The best way to get used to thinking about color separation is to do some collages. Get colored paper and make a shape. Now create shadows for that shape by putting a different colors on top of it. Once you have a good sense of how the colors interact try making shapes and shadows as separate pieces with as little overlap as possible. I suggest starting with light colors and adding the darker colors. Darks can cover lights, but getting rid of dark color doesn't work very well. Get some books that have lots of pictures. Look and see what color combinations other artists use and don't use Use your inking skills to replicate the designs you see with clean lines. 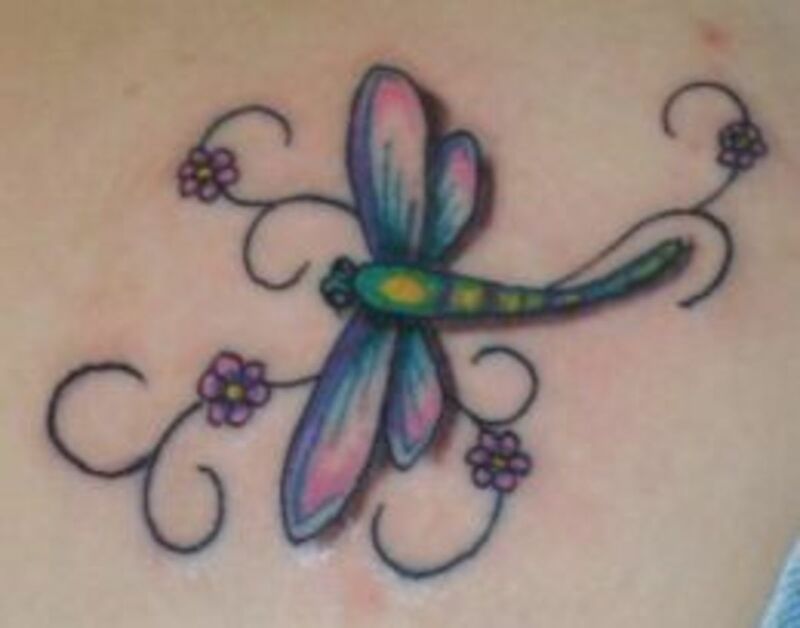 As you look through hundreds of pictures you will see that really amazing tattoos have great line work. That will be your most important skill. Now that you have a good sense of line shape and color pick up a basic set of Prismacolor or Copic Markers. These are some nice quality markers that you can use to practice more color combination and separation. Keep practicing until you can do an intricate pattern or picture on a coffee cup with clean lines. You shouldn't be putting things on other peoples bodies until you have first-hand experience of creating the design and being the canvas for it. Start off handing out fliers for an artist you like and show him or her that you are dedicated and want to work for them. As an apprentice, you are an assistant, so you will start by learning about all the things the shop does before you get to work on people. These are important skills to know, as you will probably spend more of your career cleaning up and setting up than you will inking. So, use your apprenticeship to make friends and challenge yourself. Anytime that you get a chance, do a version of things you hear people working on. Look at the flash on the wall and think about how you can make it unique. And most of all be friendly -- tattooing involves a lot of time dealing with people. Getting Your First Tattoo? Read This! What do you think of the tattoo schools they have out there. I love Copic markers, they are the best I have ever used. Great hub!